Dad’s log book, January 1989. I blurred out the names. On January 16, he dug a grave and had the funeral the same day. Later in the week, he dug a grave on Wednesday for a Friday funeral. Dad had a series of these simple, small date books through the mid-1980s. He used the books to track the number of graves he dug and where. You can see by January 18 of 1989 he already had dug seven graves. Winter burials did happen even prior to the law I wrote about in a previous post, but generally they occurred in smaller cemeteries. The bigger cemeteries usually waited until spring to bury the winter dead. In the week noted above, Dad dug at Calvary outside of Waseca and another Calvary in Madison Lake (Calvary is like the surname “Smith” of Catholic cemeteries). Those are small cemeteries, so it doesn’t surprise me that they had winter burials. Dad also liked to note the frost level. The first two, two and a half feet early in 1989 meant he was digging through what felt like solid brick. I like seeing Dad’s handwriting. He wrote in a mix of capital letters and lowercase, something I find myself doing on occasion, especially if I’m just scribbling out a quick note. What does this mean? I did a Web search, and it seems like a mix of capital and lowercase can be common when jotting things down. When you’re jotting down notes (vs. complete sentences), there’s not a need for connectedness or flow. Clarity is more important. Perhaps Dad was uncomfortable with his handwriting and was trying to be as neat as possible in his log books. If you have a loved one who has passed away, what do you have of his or hers that you cherish? 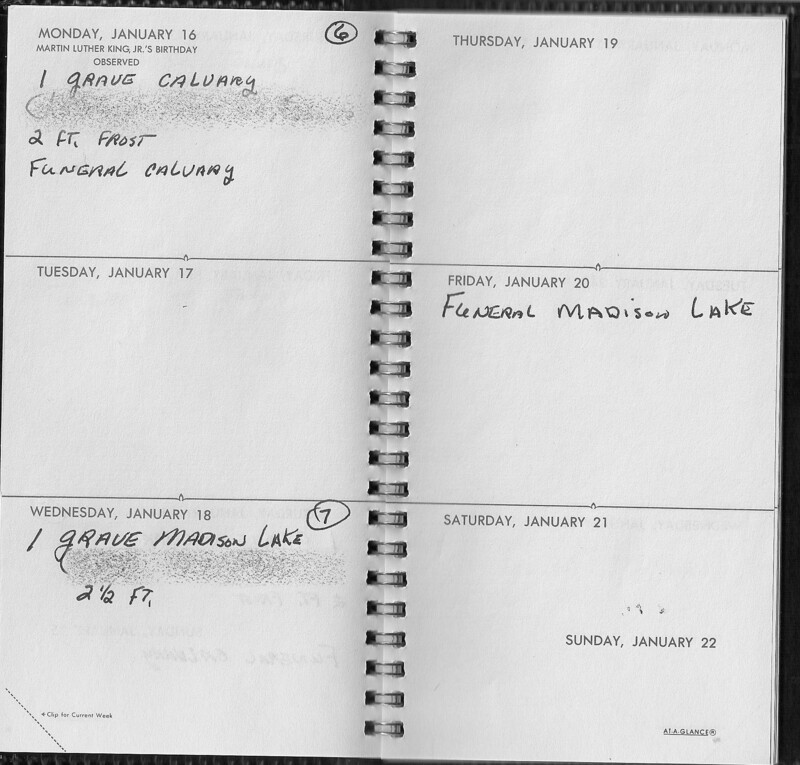 I like Dad’s log books not only because of the handwriting, but it’s something tangible that I know he held and spent time with. I can clearly picture him in his office, on his stool/chair, cigarette smoldering in the ashtray, radio on, writing in the book with his ink pen. Twenty-five years ago today, it might have been a morning just like this: cold with a fierce wind, blizzard conditions that will keep people inside. But in our house, in his office, it was cozy. The log books also still smell like his office. He went through a phase in the early ’80s when he smoked a pipe. Things that had been in his office still smell like pipe tobacco after all these years. My dad attended the National School of Fine and Applied Art in Washington, DC. The school was founded in 1916; at the time my dad was a student there, the director was Felix Mahony. The Corcoran is scheduled to have an exhibit of Felix Mahony’s art in October 2016. Among my treasures: I am lucky to have one of dad’s school portfolios, many of his photographs (we had a darkroom in the basement), and few pieces of his wood sculpture. They are all wonderful items, but I also treasure a simple box of pencils from his inherited business (my grandfather’s excavating company) in DC. I have a smoking jacket, the story of which I’d love to know, and his beloved oyster knife, which he taught me to use when I was 13. How nice to have all of those objects! Think of all the stories they tell. Any one of them would make a great centerpiece for an essay. I just lost my dad two months ago. I miss him. I swore I was going to throw his “junk” away after he passed, but when I started to do so, I couldn’t. It felt like I was throwing parts of him away, and so I stored everything in bank boxes to be looked over at later. My dad was a cook. Everyone loved Harry’s cooking. And so some of my treasures from dad’s things are his cooking utensils. The knives are so worn from daily sharpening that they are curved through the center. The handles are naturally oiled by my father’s sweat. My now favorite spatula is a simple, inexpensive Ecko spatula, not the fancy stainless steel one from William-Sonoma! I can try to cook his recipes, but I have never matched the flavors and taste that he accomplished. I cried as he got so much older and started to oversalt, or forget an ingredient. In assisted care and nursing home, he was “doomed” to someone else’s cooking. Good food, but not his taste. But yes, close to me on my desk, I keep my dad’s favorite photos, and his fishing lure. In the kitchen, his cook’s hat, that spatula, and these things keep dad near me, too. The things that you’ve kept sound beautiful. It’s like he’s there in spirit. I think a couple of months is too soon to go through everything anyway and make concrete decisions. I thought I read somewhere that people should wait at least a year before sorting through a loved one’s things.